What Structures are Involved in Aggregation? What is the Function of Link Protein? What Role Does Aggregation Play in Cartilage Structure and Function? What is the Molecular Organization in Aggregates? Timothy E. Hardingham majored in biochemistry at the University of Bristol and received his Ph.D. there in 1968. He spent a large part of his career at the Kennedy Institute of Rheumatology in London (1968-1994), working with Helen Muir on proteoglycans and articular cartilage. This work led to the identification of hyaluronan as the key component in the aggregation of the cartilage proteoglycan aggrecan. Dr. Hardingham was awarded the Colworth Medal of the Biochemical Society (U.K.) in 1978. For his subsequent work on degenerative joint diseases, he was co-winner of the Roussel International Prize for Research on Osteoarthritis (1989) and the Carol Nachman Prize for Rheumatology (1991). He is now Professor of Biochemistry in the Wellcome Trust Centre for Cell-Matrix Research in the School of Biological Sciences, University of Manchester, and is investigating functions of proteoglycan and hyaluronan in the extracellular matrix. Dr. Hardingham is Chairman of the British Society for Matrix Biology and a member of the Council of the International Society for Matrix Biology. He is currently organizing a Symposium on Hyaluronan to be held at the Biochemical Society Meeting at Leicester (U.K.) in September 1998. Cartilage is a highly specialized tissue that in higher vertebrates forms the template of long bones during development and is retained in the adult in selected sites, particularly on the weight-bearing surfaces of articular joints. Cartilage is a tissue in which the cells (chondrocytes) comprise only a few percent of the volume, and the major part of the tissue is a highly organized and expanded extracellular matrix. The important biomechanical properties of the tissue are the result of the composite structure of the extracellular matrix, which contains: 1) a dense network of fine collagen fibrils (mainly types II, VI, IX and XI), which are responsible for the form and tensile properties of the tissue, and 2) a high concentration of proteoglycan (predominantly aggrecan), which draws water into the tissue by osmosis and exerts a swelling pressure on the collagen network1. It is the retention of aggrecan in compressed form within the inextensible collagen network that causes the swelling pressure and makes the tissue ideal for resisting compressive load with minimal deformation, thereby supporting its function as a tough and resilient load-bearing surface (Fig. 1). The load-bearing properties of cartilage are provided by the tensile properties of the collagen fiber network and the osmoticswelling pressure of the high concentration of aggrecan. The aggrecan is immobilized within the matrix by forming supramolecular aggregates with hyaluronan and link protein. Aggrecan in cartilage occupies less than 15% of its fully expanded volume in solution (see aggrecan in dashed insets). Aggrecan is a proteoglycan with a core protein of high molecular weight (~250,000) encoded by a single gene that is expressed predominantly in cartilaginous tissues1. It has 3 globular and 2 extended domains (Fig. 2). Structure of aggrecan - Aggrecan contains 3 globular domains (G1, G2, G3) and 2 extended regions, which form the interglobular region between G1 and G2, and the main glycosaminoglycan attachment region. The GAG attachment region is composed of a variable keratan sulfate region and 2 chondroitin sulfate regions (CS-1 and CS-2) distinguished by their sequence patterns1. The domain structure of link protein is also shown, which is similar to the aggrecan G1 domain. In aggregates the G1 domain of aggrecan binds to hyaluronan and this binding is stabilized by link protein. PTR, proteoglycan tandem repeat. It is highly glycosylated with ~90% carbohydrate, mainly in 2types of glycosaminoglycan chains, chondroitin sulfate and keratansulfate. Each aggrecan contains ~100 chondroitin sulfate chains,which are typically ~20 kDa each, and the chains are either 4-sulfated,6-sulfated, or usually both. There are fewer keratan sulfate chains(up to 60), and they are usually of shorter length (5-15 kDa).The chondroitin sulfate chains are all attached to the long, extendeddomain between globular domains 2 and 3, but the keratan sulfatechains are more widely distributed. They are most abundant ina keratan sulfate-rich region just C-terminal to the G2 domain.They are also attached elsewhere on both extended domains andon the G1 and G2 domains. Aggrecan also contains a variable numberof O-linked oligosaccharides and N-linked oligosaccharides. TheO-linked oligosaccharides have a linkage to protein similar tothat for keratan sulfate, and it appears that during biosynthesissome O-linked oligosaccharides are extended and sulfated to formkeratan sulfate chains, whereas others are not. Variations inthe proportion extended to form keratan sulfate and the lengthsof the chains synthesized are thus likely to account for thelarge differences in the content of keratan sulfate in aggrecanobtained from different cartilages. The primary gene product of aggrecan, the protein core, is thusvariably glycosylated by the chondrocytes in which it is expressedto give secreted macromolecules that show a broad range of composition1.They always contain a high glycosaminoglycan content, but withvariable numbers of chains of variable lengths and different patternsof sulfation. Although it is clear that many factors affect thesynthesis of glycosaminoglycan chains and oligosaccharides, itis not yet fully understood how the composition of aggrecan relatesto the age and site of the tissue or to the range of growth factorsand cytokines acting on the chondrocytes in which it is expressed. The 3 globular domains of the aggrecan protein contain sequencesthat are highly conserved amongst aggrecan from different vertebratespecies, but the extended domains are less well conserved. Thereis, for example, considerable variation in the length of the keratansulfate-rich region amongst different species, and even this regionhas considerable polymorphism in the human population. This suggeststhat small variations in the large amount of glycosaminoglycanpresent on aggrecan are of little consequence to its major function,but that the functions of the globular structures are more sensitiveto changes in sequence.Whilst the G1 and G2 domains have related structures (discussedbelow), the G3 domain is distinctly different and contains 4 quitedifferent protein modules: a complement regulatory protein motif,two alternatively spliced epidermal growth factor-like sequences,and a calcium-dependent, mammalian C-type lectin motif. Althoughlectin properties of the G3 domain have been detected, the naturalligands have not been identified, and the likely function of thisdomain in matrix organization has yet to be determined. Experiments in the laboratories of Sam Partridge and Martin Mathewsin the late 1950s and early 1960s suggested that the proteoglycansfrom cartilage formed large aggregates, but it was the introductionof the use of guanidine hydrochloride as a dissociative solventby Hascall and Sajdera2 that allowed this process to be characterized in detail. Theyestablished the conditions for demonstrating the reversible dissociationof large proteoglycan aggregates into monomeric species. It wasthen, through my work with Helen Muir, that we identified hyaluronanas the key element that held aggregates together3 by showing that adding small amounts of hyaluronan (~1%) to asolution of proteoglycan monomers dramatically increased the viscosity.The association between aggrecan and hyaluronan was certainlynot initially suspected, as the binding of one polyanion by anotherwas thought to be most unlikely because of their charge repulsion.At that time, work with large macromolecules was also restrictedby the techniques available and by the exceptionally non-idealbiophysical behavior of aggrecan and hyaluronan in all but verydilute solution. However, the effects of hyaluronan in promoting aggregation werenot produced by other polyanions, such as DNA, alginate, chondroitinsulfate, or dextran sulfate, and this formed a strong argumentagainst non-specific polyanion effects. Indeed, the subsequentdemonstration that a decasaccharide of hyaluronan (5 repeatsof the disaccharide -glcA-beta1,3 glcNAc-beta1,4-) was the minimumsize required for interaction, established that aggregation wasa function of the aggrecan protein core. Aggrecan was thus thefirst member of this hyaluronan-binding family of proteins tobe identified4. Three additional hyaluronan-binding proteoglycans (versican, neurocan, and brevican) have now been cloned (Fig. 3). These all contain sequences related to the globular domains ofaggrecan and form a family of hyaluronan-binding proteoglycans1. The hyaluronan-binding family of proteins related to aggrecan - Schematic models of the domain structures of the proteoglycans aggrecan, versican, neurocan and brevican; the cell surface HA-receptor CD-44 and the matrix molecules TSG-6 and link protein. The brackets in aggrecan mark the alternatively spliced EGF-like domains. 4. What Structures are Involved in Aggregation? The globular N-terminal G1 domain of aggrecan contains a lectin-likebinding site with high affinity for hyaluronan and is responsiblefor the formation of aggregates. As hyaluronan is a long, unbranchedchain with molecular weights of up to several million, each chaincan bind a large number of aggrecans to form aggregates up toseveral hundred million in molecular weight (Fig. 4)5. The binding of each aggrecan to hyaluronan is further stabilizedby a small glycoprotein (45 kDa) referred to as link protein4, 6. A ) Preparation of aggrecan from fetal bovine epiphyseal cartilage5contrasted with cytochrome C and spread on nitrocellulose. The main axis is the hyaluronan chain (~5 micrometers long) with ~200 aggrecans (and link proteins) bound to it. 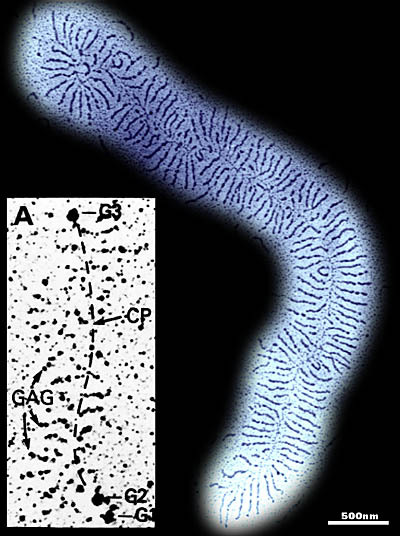 A (inset) B-D) Rotary shadowed aggrecan preparations revealing the globular protein domains (Morgelin et al., 1988). The dashed line indicates the approximate location of the extended portions of the core protein (CP), which are not readily visualized by this procedure. B) Aggrecan digested with chondroitinase ABC to remove chondroitin sulfate. It is bound to hyaluronan by the G1 domain, leaving the G3 domain (arrows) at the non-binding end, away from the hyaluronan chain. C) Isolated G1-G2 fragment of aggrecan bound to hyaluronan in the absence of link protein. The preparation contains an excess of the G1-G2 fragment to give a maximum packing density on the hyaluronan (~1 per 12 nm). The G2 domain fails to bind to hyaluronan and remains away from the hyaluronan chain (arrows mark possible superhelical regions). D) As in C, with aggregates saturated with G1-G2, but formed in the presence of link protein. The spacing was unchanged and the G2 domain remains uninvolved with the hyaluronan and link protein. The G1 domain of aggrecan contains 3 protein motifs: an immunoglobulin fold (Ig-fold) and 2 copies of a hyaluronan-binding motif, or link module (also referred to as the proteoglycan tandem repeat (PTR)). The link module is present in tandem in all members of the hyaluronan-binding family of proteoglycans and in link protein, but it is also present as a single copy in the cell surface hyaluronan-binding receptor CD-44 and in TSG-6, a secreted matrix protein whose synthesis is induced by inflammatory cytokines. The 3-dimensional structure of the recombinant link module from TSG-6 has now been determined by NMR spectroscopy and shown to be related to the mammalian type-C lectin family of carbohydrate-binding motifs (Fig. 5)7. Structural model from NMR spectroscopy of the link module that binds to hyaluronan (Kohda et al., 1996) - The model is from the structure of the recombinant TSG-6 link module determined by NMR spectroscopy. It consists of 2 alpha helices (alpha 1 and 2) and two antiparallel beta sheets (beta 1-6), arranged around a large hydrophobic core. The structure has some similarities with mammalian C-type lectin domains. Link protein has a structure very similar to that of the aggrecan G1 domain, as it contains an Ig-fold and 2 link modules, which suggests that they share a common ancestral gene. The structure of the G2 domain of aggrecan poses interesting, unresolved questions because it too is structurally related to G1 and link protein. Although it lacks an Ig-fold, it contains 2 copies of the link module. However, no hyaluronan-binding properties of the G2 domain have been detected, and it is difficult to understand what role a second hyaluronan-binding site on aggrecan could play in the formation of aggregates. The binding of aggrecan to hyaluronan exhibits a high affinity with a Kd = 2 x 10-8 M4. The affinity remains high throughout the pH range 6-9, but at lower pH it is more dissociated, showing no binding at pH 3. On warming from 25oC at pH of ~7, the binding dissociates reversibly up to ~65oC. At higher temperatures, the G1 domain slowly denatures irreversibly, but even at 80oC, it has a half-life of ~115 minutes. In saline at physiological pH, it is also resistant to proteinase attack. The G1 domain renatures after exposure to many denaturing agents; guanidine hydrochloride, urea, and potassium thiocyanate. It also survives treatment with solvents, such as ethanol, acetone, or ether, without loss of activity. Reduction of the disulfide bonds in the G1 domain efficiently abolishes binding to hyaluronan, but even after reduction, their re-oxidation under non-denaturing conditions can lead to a significant recovery of binding activity. These properties all suggest that the native structure of the G1 domain is resistant to denaturation and strongly thermodynamically preferred, such that it re-forms from denatured conditions with high efficiency. The G1 domain of aggrecan thus appears to be a tough, stable structure suited to its long lifetime in the extracellular matrix. 5. What is the Function of Link Protein? The link protein in the aggregate structure strengthens the aggrecan-hyaluronan bond4, 6 by forming a ternary complex involving both an interaction with hyaluronan mediated by the 2 link modules, and an interaction with the G1 domain through their Ig-folds. Thus aggregates formed in the presence of link protein do not dissociate significantly at physiological ionic strength and pH. Thermal stability is also enhanced, as no dissociation of link-protein-stabilized aggregates is detected up to 55-60oC, whereas at higher temperatures the link protein appears to denature irreversibly. Link protein is less glycosylated than the G1 domain, and when purified, it tends to come out of solution. The interaction between the Ig-folds in link protein and the G1 domain appears to "lock" aggrecan onto the hyaluronan chain to form the compact ternary unit of the native aggregate structure. It is interesting that polyclonal antibodies to link protein do not detect it well in the intact aggregates, suggesting that the major epitopes on link protein are concealed in the native structure. In contrast, polyclonal antibodies to the G1 domain are generally able to interact with G1 epitopes in aggregates without hindrance, showing that the epitopes in this case are more accessible. 6. What Role Does Aggregation Play in Cartilage Structure and Function? Aggrecan is synthesized and secreted continuously by chondrocytes, and it follows the same intracellular pathways of synthesis as other secretory proteins4. The mRNA is translated on membrane-bound ribosomes into the rough endoplasmic reticulum, followed by translocation to the Golgi for the main steps of O-glycosylation and glycosaminoglycan chain synthesis. The glycosaminoglycans appear to be synthesized rapidly on aggrecan as part of a highly concerted process that occurs just before secretion. There is no intracellular storage of the finished molecule prior to its release. Link protein, although it is less glycosylated and has no glycosaminoglycan chains, is also synthesized along the same intracellular pathway. However, hyaluronan is not synthesized within these same compartments within the cell, but is formed by a synthase enzyme that appears to be located in the plasma membrane, such that the elongating hyaluronan molecule is secreted directly into the extracellular matrix. Aggrecan and link protein thus encounter hyaluronan only after their secretion by the chondrocyte into the extracellular matrix. Therefore, aggregation is an extracellular mechanism for the assembly of aggrecan into higher order structures. As this favors retention of aggrecan within the cartilage extracellular matrix, this process plays a major role in maintaining the large concentration of aggrecan in the matrix required to support the tissue's biomechanical properties. 7. What is the Molecular Organization in Aggregates? Determination of the stoichiometry of aggregation showed that when hyaluronan was saturated with bound aggrecan, the weight ratio was about 1 to 140. This suggests that for each mole of aggrecan (average molecular weight 2 million) bound to hyaluronan, there was a minimum hyaluronan mass of ~7,000. This indicates that each aggrecan would occupy a length of hyaluronan with 32-36 sugars, which, if extended, would be about 17 nm long. Electron microscopy of aggregates prepared in monolayer films to contrast the glycosaminoglycan chains (the Kleinschmidt technique) showed that their structure consisted of a large number of aggrecan monomers attached to a central filament of hyaluronan (Fig. 4)5. The average spacing between each monomer was 25 nm, although this spacing was reduced to about 18 nm in preparations with a greater degree of saturation with aggrecan. In preparations visualized by rotary shadowing to reveal the globular protein domains, purified G1 domain bound to hyaluronan with a minimum spacing of 12 nm, but at less than saturating densities the G1 domain was spaced more widely, with no evidence of cooperative binding8. A minimum spacing of ~12 nm was also found in rotary shadowed images of the isolated aggrecan G1-G2 fragment bound to hyaluronan. In these complexes, the G2 domain always remained separate from the G1 domain and away from the hyaluronan. In the presence of link protein the packing density of G1-G2 did not change, but the shadowed protein now appeared as a continuous coating to the central hyaluronan chain and not as discrete globular complexes. This appearance of a continuous protein coat on the hyaluronan is also seen in rotary shadowed preparations of intact aggregates, which may imply some cooperative association between adjacent G1 domain-link protein complexes along the hyaluronan chain. The extended segment between the G1 and G2 domains appears ratherstiffened, as its length in rotary shadowed images is remarkablyconstant, 21+/-3 nm8. This segment contains some keratan sulfate, which likely contributesto its extended structure. However, it also contains the majorsites for proteinase attack on aggrecan, which is important inboth normal and cytokine-stimulated catabolism by extracellularproteinases1. Proteolytic cleavage in this region releases the G2 domain alongwith the attached large glycosaminoglycan-bearing region fromthe aggregate. Tight packing of the G1 domain and link proteinon hyaluronan in the aggregate structure makes them resistantto proteinases and leads to a progressive increase of hyaluronancoated with G1 and link protein in the tissue with age. Theirpresence is readily evident in extracts of old human cartilage,where it has been estimated that only half the G1 domain in thetissue is still part of large aggrecan molecules. It is interestingto note that in young, developing cartilage, the amount of hyaluronanis about 1% of the aggrecan, an optimum content to bind all theaggrecan at maximum density into large aggregates. It may alsoimply that the synthesis and turnover of hyaluronan and aggrecanin cartilage are closely coordinated. There is a progressive increasein hyaluronan in cartilage with age to almost 10% of the aggrecancontent. This increase thus occurs, at least in part, becausea large proportion of the hyaluronan is occupied with the accumulated G1 domain fragments of aggrecan and link protein. Aggregation in cartilage appears to be a mechanism for the assembly of very large extracellular molecules that immobilizes the polyanions (chondroitin sulfate and keratan sulfate) within the fine network of collagen fibrils. This is very important, not only to maintain the biomechanical properties of the tissue, but also to define the form of the tissue during its initial development when chondrocytes are first establishing and expanding the cartilage matrix. Other members of the hyaluronan-binding family of proteoglycans are found in extracellular matrices that have biophysical properties very different from those of cartilage. Versican is found in the dermis of skin and in the media of the aorta, where "immobilization" may not appear to be a major function. These "soft" connective tissues contain much more hyaluronan than cartilage, which implies that aggregation would favor the formation of much smaller molecular assemblies. The metabolism of hyaluronan in such matrices also appears to be very active, with rapid turnover rates. Nevertheless, in these more cellular tissues, the extracellular matrix compartment is a much smaller fraction of the tissue volume than in cartilage, and the concentrations of components within this matrix are still likely to be quite high. The supramolecular organization created by aggregation may therefore still have a major influence on the local tissue properties, on cellular interactions with the matrix, and on macromolecular diffusion within the matrix. It may also be that other interactive properties of the proteoglycans, such as lectin-binding of the G3-like domains, contribute more to matrix organization than appears to be the case in cartilage. There have been very few studies of aggregation in any tissue other than cartilage, and it may be that we have yet to discover the full range of its biological functions. In the extracellular matrices of vertebrate tissues, hyaluronan has evolved as the backbone for the assembly of a family of proteoglycans into large, soluble, multimolecular aggregates. Aggregation involves lectin-like interactions that are highly specific for hyaluronan and provides an unusual example of one type of polyanion being assembled on another. A small link protein, structurally related to the proteoglycan, is important in stabilizing the aggregate. The link-module responsible for hyaluronan-binding of link protein and the proteoglycans is also found on other proteins, such as CD-44 and TSG-6. Its structure has been determined and shown to be related to that of the mammalian C-type family of proteins, but it differs in that its carbohydrate-binding properties are not calcium dependent. Proteins containing the link module are the major ligands for hyaluronan in the extracellular matrices of higher animals. 1. Hardingham TE and Fosang AJ: Proteoglycans: many forms and many functions. FASEB J. 6, 861-870, 1992. 2. Hascall VC and Sajdera SW: Proteinpolysaccharide complex from bovine nasal cartilage. The function of glycoprotein in the formation of aggregates. J. Biol. Chem. 244, 2384-2396, 1969. 3. Hardingham TE and Muir H: The specific interaction of hyaluronic acid with cartilage proteoglycans. Biochim. Biophys. Acta. 279, 401-405, 1972. 4. Hardingham TE: Proteoglycans: their structure, interactions and molecular organisation in cartilage. Biochem. Soc. Trans. 9, 489-497, 1981. 5. Buckwalter JA and Rosenberg LC: Electron microscopic studies of cartilage proteoglycans. Direct evidence for the variable length of the chondroitin sulfate-rich region of proteoglycan subunit core protein. J. Biol. Chem. 257, 9830-9839, 1982. 6. Heinegård D and Hascall VC: Aggregation of cartilage proteoglycans. 3. Characteristics of the proteins isolated from trypsin digests of aggregates. J. Biol. Chem. 249, 4250-4256, 1974. 7. Kohda D, Morton CJ, Parkar AA, Hatanaka H, Inagaki FM, Campbell ID and Day AJ: Solution structure of the link module: a hyaluronan-binding domain involved in extracellular matrix stability and cell migration. Cell 86, 767-775, 1996. 8. Morgelin M, Paulsson M, Hardingham TE, Heinegård D and Engel J: Cartilage proteoglycans. Assembly with hyaluronate and link protein as studied by electron microscopy. Biochem. J. 253, 175-185, 1988. Copyright © Glycoforum All Rights Reserved.